We’d love your help. Let us know what’s wrong with this preview of Odyssey One by Evan Currie. Past the bounds of comfort, they encounter horrors and wo Beyond the confines of our small world, beyond the well of our star, lies a galaxy, and universe, larger and more varied than any of us can imagine. Assigned the task of blazing man's first trail into that great unknown, Captain Eric Weston and the crew of the NAC Odyssey launch on a mission destined to make history. To ask other readers questions about Odyssey One, please sign up. Should I get this on Audible now? There's a nice 2 for 1 sale. It seems a new recording by David de Vris will be available in April. Am curious whether this one will be better/preferable over the Benjamin L. Darcie reads. Does the book take place within the milky way ? If you're looking for some great pew-pew, vroom, and kaa-plowie action, this novel has it in spades and spades, and i Often, with me, Space Operas are hit or miss. There's either too much mindless action or too much mindless action or there's even too much mindless action. This book was just what I was looking for at the time I picked it up (low-brow schlub that I am). I have included it on my space-opera shelf as well as my other science fiction shelves. We get lots of action here, lots of esprit de corps as the crew of the "new star ship", made up of people from all services pull together into one cohesive unit. So far as this being a military science fiction/military fantasy we get fleet action, groundpounder action, even space fighter action. Yes the story is w This book was just what I was looking for at the time I picked it up (low-brow schlub that I am). I have included it on my space-opera shelf as well as my other science fiction shelves. We get lots of action here, lots of esprit de corps as the crew of the "new star ship", made up of people from all services pull together into one cohesive unit. Yes the story is well into science fantasy as well as science fiction and that will probably "alienate",(get it, science fiction...alienate...??? Oh well) some readers. However, I think there's enough hard science involved in the story to appeal to "some" hard science fiction fans. Of course I realize others will be annoyed when that is twisted or whatever... Life I guess. 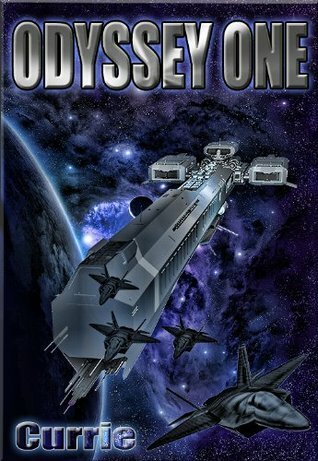 This is an adventure read, a first contact read, a war/combat fiction read it's enjoyable on several levels and I think most who enjoy imaginative reads will find something to like here. Into the Black is the first published work (as nearly as I can tell) by Evan Currie, published thought he Kindle Direct Publishing program that Amazon has put into place. It is a piece of military science fiction. For those not entirely familiar with the term, military science fiction is just that - science fiction focused around some military organization. In most cases, it involves mankind at war against either themselves or some variety of aliens. 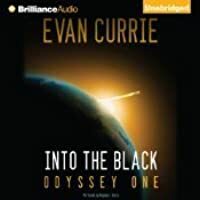 Into the Black focuses on the first voyage of Into the Black is the first published work (as nearly as I can tell) by Evan Currie, published thought he Kindle Direct Publishing program that Amazon has put into place. It is a piece of military science fiction. For those not entirely familiar with the term, military science fiction is just that - science fiction focused around some military organization. In most cases, it involves mankind at war against either themselves or some variety of aliens. Into the Black focuses on the first voyage of the Odyssey - a new, high advanced spacecraft built by a conglomeration of nations formed in the aftermath of a war with the other conglomeration of nations. The Odyssey is piloted by Eric Weston, a highly decorated pilot from the aforementioned war, has been assigned to leave the solar system and test their new FTL drive. During this, they make contact with an entire civilization of humans and the bugs that are trying to kill them. Naturally, matters move forward and the Odyssey finds itself taking an active part in the war. This mostly seems to be due to the fact that Earth humans are good at fighting wars, and alien humans really don't have a clue in that regard. There are other reasons, but going into them would be spoilers. Into the Black brings into play a variety of characters - this is nearly 600 page book, after all. It handles them with a certain amount of skill - characters stay in character and dialog is somewhat interesting. The military jargon flows thick here, though, and many of the characters would have benefited from a little more in-depth exploration of their motivations; in all but two or three characters, we never get to know these people outside of their uniforms. One thing the book does very well is technology. The writer clearly has a pretty good grasp on lasers, and shows that throughout the book. He also is able to write about tachyons good enough to allow one to suspend disbelief about the vast variety of uses that they are put to (which is a talent required of any science fiction author, especially one writing about FTL). The combat scenes are also very interesting, though the space combat is, perhaps, more so than the ground combat. Descriptions are done well enough to allow one to visualize what he's talking about, and he mostly succeeds in not putting the reader to sleep with page after page of technology explanations. In this, he succeeds in not falling into a pit fallen into by many other, very good, science fiction writers. The book's primary enemy is the Drakin, a sort of rock-based insectoid race. Its an interesting concept for a race, particularly given a revelation made in the epilogue of the book, but the Drakin have no real personality. We're given no reason for understanding why they're prosecuting this war, other than "they are terrible creatures who are going to eat us all". This short-changes a potential interesting conflict, and threatens to turn it into a meaningless exercise in blowing up the evil bugs. Another frustration are the alien humans. Throughout the book, we're given the barest hints as to where this civilization came from, and various vague references to an Oath. At no point does the book go deeper into these details, however much one can imagine the characters asking and however curious the reader is to know. It is, in fact, somewhat probable that the Drakin and this Oath are all tied together - a little more explanation to this could have made the Drakin a more interesting enemy. Just finished and would like to quote Cpt. Weston as much as Adm. Tanner: "Wow!" The author is incredibly good in writing what I call a classical sci-fi novel. Nothing is sleek, shiny or too clean as most new sci-fi novels and movies are. The characters are being introduced, then developed as if the reader was on board the Odyssey itself (the crew got scrambled together so that gives the reader a sense of reality). The action is incredible, breathtaking and exhilarating but also the science, poli Just finished and would like to quote Cpt. Weston as much as Adm. Tanner: "Wow!" The author is incredibly good in writing what I call a classical sci-fi novel. Nothing is sleek, shiny or too clean as most new sci-fi novels and movies are. The characters are being introduced, then developed as if the reader was on board the Odyssey itself (the crew got scrambled together so that gives the reader a sense of reality). The action is incredible, breathtaking and exhilarating but also the science, politics and inter-human relations are being adequately and elaborately described. Great book! And while reading the last few chapters, I discovered that the second part will be available in September already! Yay!!! With respect to the spelling/grammar errors, I know this is an indie publication and I don't expect perfection. Nevertheless, it looks like the author never read his manuscript twice. Besides the constant use of "then" instead of "than" and other errors, there are also several cases where one paragraph repeats the previous or contradicts the next. (view spoiler)[The author also apparently forgot about one of the most devastating weapons of the Drasin, a weapon that incapacitated the crew of the Odyssey during their first encounter. (hide spoiler)] There were also at least two cases where in the middle of the action the author goes on on a tangent to give the history of a rifle or a weapon (something that he doesn't bother to do for most of his main cast) ruining the pacing of the story. This book needs some editing, even some unprofessional one from a friend would improve it considerably. This is Space Opera - Science Fiction. For the most part, this was 3 stars for me. It was heavy on the science which isn't a bad thing even though science was never a favorite subject of mine. There were times where it seemed a little on the wordy side. I did add a star to the rating because I was impressed by the time I finished. I liked the story and the characters, even though both were a little on the 'perfect' side. The world building was also nicely done. There were also some thought provo This is Space Opera - Science Fiction. For the most part, this was 3 stars for me. It was heavy on the science which isn't a bad thing even though science was never a favorite subject of mine. There were times where it seemed a little on the wordy side. I did add a star to the rating because I was impressed by the time I finished. I liked the story and the characters, even though both were a little on the 'perfect' side. The world building was also nicely done. There were also some thought provoking questions and they were eloquently tossed around. I always appreciate when there is that kind of food for thought. But the one thing I absolutely loved, was the ending. When I finished, I immediately thought, "Where do I get the next one in the series?" Really the ending was worth getting to. So 4 stars and I'll definitely be moving forward in the series. Because he was such a spectacular fighter pilot during WWIII, Captain Eric Weston has been given command of the new spaceship Odyssey which is making her maiden voyage beyond the galaxy, to boldly go where no man has gone before. What Weston and his crew find out there is quite a surprise: a small spacecraft emitting a distress signal and containing a nearly dead human woman named Mia. When they take Mia back to their ship, reviv Originally posted at FanLit. When they take Mia back to their ship, revive her and learn her language, they discover that her ship had been attacked by non-human aliens. In fact, the Odyssey has arrived just in time to witness the aftermath of the destruction of an entire planet of humans by a horde of insectoid aliens, and these aliens don’t seem to be content with just one planet. The human targets, unfortunately, are somewhat pacifistic and do not have the weapons they need to defend themselves. For Captain Weston, there are so many questions that need answers. First, obviously, is how there are humans so far away from Earth… but that’s going to have to wait, because the most pressing concern is whether or not the crew of Odyssey should try to help their genetic cousins. Their duty, after all, is to go straight back to Earth and report what they’ve found because if they stay and help, they’ll likely be destroyed, and then Earth won’t know to prepare for a possible alien attack. But can they, in good conscience, leave their defenseless fellow humans to certain destruction? Of course not. Into the Black, the first in Evan C. Currie’s ODYSSEY ONE saga, is a fast-moving military science fiction novel akin to Jack Campbell’s LOST FLEET or David Weber’s HONOR HARRINGTON series. It also reminded me somewhat of Taylor Anderson’s DESTROYERMEN series (Americans surprised to find humans in another world and needing to fight hordes of hive-minded aliens) and, because our heroes are fighter pilots, the movie Top Gun, and of course, Star Trek. Into the Black was originally self-published but has been picked up by 47North, an Amazon imprint whose books are produced on audio by Brilliance Audio. Unfortunately, Into the Black, feeling like a mish-mash of several other military and/or science fiction series, doesn’t really stand out in any way. Plotwise, I don’t think there was anything in Into the Black that I haven’t seen before. It’s all a bit gadgety with lots of emphasis on how the guns, spacesuits, and spaceships work, including lots of explanation about vectors, velocity, weapon trajectories, and such. For readers who love, or at least aren’t tired of that sort of thing, Into the Black may be a satisfying (if not original) story. I would have enjoyed Into the Black more if it had excelled in some other area, but it doesn’t. The writing is merely serviceable and even a bit choppy in places. The jokes that make the fighter pilots chuckle didn’t have the same effect on me. I was baffled by a sudden shift in Currie’s style about half way through the book: his characters, who had not uttered (I believe) a single curse word up until that point, abruptly start cursing regularly, and this couldn’t be explained by the story’s plot. I was seriously wondering if someone else was now writing the dialogue, or if Currie had suddenly obtained permission from his editor to use bad language. The language didn’t bother me — the obvious stylistic switch did. Another thing that didn’t work too well was the characterization, which is not an uncommon problem in gadgety science fictions stories. Currie does a good job with Captain Weston (though I’m still wondering how his superiors thought he was qualified for this mission) and a few of his characters are quite likeable, but most of them seem like stock characters. Perhaps there are only, as Myers-Briggs suggests, 16 different personality types to work with, but some more background or introspection from the main secondary characters would have helped. This is perhaps forthcoming in future installments of the ODYSSEY ONE series. The crew is also unwaveringly courageous, obedient, and noble, even when faced with an attack by a horde of aliens they didn’t know existed. The humans that the Odyssey encounters are similarly pale. Except that they were pacifists and had different fashion trends, Mia’s race was indistinguishable from American people. You’d think that humans living in another galaxy wouldn’t be so much like us. This book gets my personal BIBLIOGASM award. You know, that high we all get when reading a good book. Where your practically jumping out of your skin with anxiety, anticipation. Losing sleep because you have to know what happens. Slightly manic and bursting to tell anyone who will listen how good the story is. I was really excited because it's hard for me to find military sci-fi that I like. That has a good story, straight-forward space travel and battle technology, no cookie-cutter characters a This book gets my personal BIBLIOGASM award. You know, that high we all get when reading a good book. Where your practically jumping out of your skin with anxiety, anticipation. Losing sleep because you have to know what happens. Slightly manic and bursting to tell anyone who will listen how good the story is. I left the Earth's orbit right along with the Odyssey on its' maiden voyage to test it's new faster-than-light jump technology. Manned with a crew of 300 of the world's best military, scientists etc. I was drawn in to the mystery when they jumped to a system that held debris and wreckage from a very recent fight and further when they find a pod with a HUMAN in it. She explains that they were attacked by alien creatures and the epic battles that go on as the Odyssey and it's valiant crew fight them and we find out more about these colonies of humans so very far from earth. I had a great time, got caught up in the semper-fi life and death human survival of it all. What to say, the book is competently written with a fast paced plot and looooots of action and some great „stealth“ sections. The tech is futuristic, of course, but described just enough for us to suspend the disbelief and see it as possible. And the story is nicely rounded with an ending that suggest grand things to come. Personally the greatest failing for the book ar the characters. Fairly one dimensional and uninteresting. I understand they are not important and so the focus isn More like 2.5. Personally the greatest failing for the book ar the characters. Fairly one dimensional and uninteresting. I understand they are not important and so the focus isn’t on them but still I didn’t care for anybody and as a result lots of tension that the book builds simply had no effect on me. I mean I was rooting for the humans but I didn’t care if half of them died or not which made those slow parts simply boring to me. 3.5 stars is more accurate. I thought it was a good first book to the series. As is typical of sci-fi, the first few hundred pages are devoted to an explanation of technology and world-building. There was also a bit of rush to get to the action, but once the action got started it was pretty good. I liked the characters, and it was easy to get invested in them despite the somewhat sterile environment of a military spacecraft. I'll be reading the next one to find out what happens. I didn't like this book. It's too heavy on military tack and bearing and very light on science fiction. I knew pretty much from the first several pages that this person is a lightweight sci fi writer. I think I read a review that said as much. The book is based on the story line that a ship from Earth named the Odyssey One leaves on an exploratory mission around the universe. But the ship uses a technology that makes the crew sick when it goes faster than light speed and the ship is more a battl I didn't like this book. It's too heavy on military tack and bearing and very light on science fiction. I knew pretty much from the first several pages that this person is a lightweight sci fi writer. I think I read a review that said as much. The book is based on the story line that a ship from Earth named the Odyssey One leaves on an exploratory mission around the universe. But the ship uses a technology that makes the crew sick when it goes faster than light speed and the ship is more a battle ship with all types of armament than a scientific exploratory ship. The ship is run like an Earth bound battle ship with descriptions of lots of military terms. The heart of the story is a battle with an enemy that the crew/ship encounters after if finds other human life. But it's not until the Epilog that any description is given of this enemy. And then only a few words of description. There really are too many editing errors in this book. This couldn't stop me from giving this the five stars it deserves. Of the 6+ books Evan Currie has written, this is the third one that I have read. Interestingly enough it's as impressive to me as his others because it was his first. This fact is only noticeable through the editing error that mottle this otherwise exceptional military science fiction. Take note, Evan C. Currie is to military science fiction what Brandon Sanderson is to fantas There really are too many editing errors in this book. This couldn't stop me from giving this the five stars it deserves. Of the 6+ books Evan Currie has written, this is the third one that I have read. Interestingly enough it's as impressive to me as his others because it was his first. This fact is only noticeable through the editing error that mottle this otherwise exceptional military science fiction. Take note, Evan C. Currie is to military science fiction what Brandon Sanderson is to fantasy. Sanderson just has/is a better editor. There I said it. Into the black bag. Shocker. DNF. Good enough to make you want to read the rest of the series. The overall concept was neat: humans venture forth to find civilization(s) much more peaceful than ours, where our penchant for violence and conflict is exactly what's needed to save the day. However, the actual storytelling is as vibrant as mayo on white bread. The vast majority of characters are just names, a few with varying degrees of military bravado. Much of the activity in the book is a recounting of procedure, or bland technical descriptions. I'm not opposed to military sci-fi. There are s The overall concept was neat: humans venture forth to find civilization(s) much more peaceful than ours, where our penchant for violence and conflict is exactly what's needed to save the day. I'm not opposed to military sci-fi. There are some good ones out there, e.g. Ringo, Weber. This one just isn't. Too often the author is rattling off details [apparently] just to show he knows some military history. And the endless justifications for why 20th century equipment and tactics are still the best in this age wears thin fast. My last gripe: Earth's first odyssey into space and they find life on their FIRST leap into the void... and there is NO sense of wonder. Sure, this isn't Star Trek and the characters are military personnel, but the idea no one is excited by answering one of the greatest questions in the universe ("Are we alone?") was disappointing. Also, I do not believe that there had been sufficient 'history" to explain why the Captain and crew were so adept at fighting other space ships in space; why they had all the procedures and plans at their fingertips. As far as I could tell all of the Earth war fighting had been done on land or using attacks from orbit. Nevertheless, I enjoyed the book and will look for the next one in due course. This is a classic space opera tale, big on space battles with a new twist of faster than light speed travel. First of series and it does a great job of setting up an extended plot without cheating you at the end of this tale. Character development was pretty good as far as it went meaning that when there wasn't space battles going on the characters were pretty interesting. The battles were good but a little drawn out and detailed for my taste. I never could quite visualize some of the action, so This is a classic space opera tale, big on space battles with a new twist of faster than light speed travel. First of series and it does a great job of setting up an extended plot without cheating you at the end of this tale. Character development was pretty good as far as it went meaning that when there wasn't space battles going on the characters were pretty interesting. The battles were good but a little drawn out and detailed for my taste. I never could quite visualize some of the action, so that's what made it seem drawn out to me. This was better than some of my 3 rating books, but not as good as some of my 4 so I went with a 3. Entertainment value is good, not much on the thought provoking side (however I did like the theme of the use of violence vs peace, that was a minor thread). I do recommend and plan on continuing with the series. I'll admit that I did not finish this book. This is the only book on goodreads that I failed to finish and still reviewed. I read most of the book a year ago and failed to get into it. Honestly, I think it was Evan Currie's writing style. I did not feel connected to the characters or absorbed into the space odyssey environment that I was promised. This is an engaging first contact, space military adventure. My rating 4.25. The Odyssey is the first spacecraft sent out from earth with a crew culled from the best of the best. They were really on a test mission, intended to see what the Odyssey can manage and do a little exploring beyond the Solar System. They didn’t plan upon warping into the debris of a devastating battle…and rescuing a survivor. Now they know there are other human races in the universe… and other unknown, and apparently bru This is an engaging first contact, space military adventure. My rating 4.25. The Odyssey is the first spacecraft sent out from earth with a crew culled from the best of the best. They were really on a test mission, intended to see what the Odyssey can manage and do a little exploring beyond the Solar System. They didn’t plan upon warping into the debris of a devastating battle…and rescuing a survivor. Now they know there are other human races in the universe… and other unknown, and apparently brutal, alien beings. Captain Weston is new to the position of North American Confederation (NAC) spaceship captain but he is a battle experienced pilot having led the legendary Archangel Flight Group, the specialized fighter units. Weston tries to return their rescued passenger to her nearest planet world only to find an unimaginable situation. Now he must decide if he jumps out of this galaxy to return home or flies into a battle that isn’t their business… or is it? The characters are likeable and I wasn’t bothered by some familiarity among the ranks that wouldn’t be expected in a real military protocols. The other galaxy human characters have different backgrounds, views and technology that make the interaction interesting. The space travel tachyon (dissolving and restoring particles) is creepy and pretty disturbing, even to the characters. It wasn’t quite clear to me if the alien species is tech or ‘insect’ but their behaviors were engaging, if devastating. The story moves at a good pace with action and mystery pulling my interest. I admit I spent a couple of nights listening later than I should. I recommend this as a fun, action packed ride to readers who like space opera and first contact genre. Evan Currie’s military science fiction space opera novel Into the Black: Odyssey One, originally self-published, was released by Amazon’s new imprint 47north back in March. The novel centers around the exploration crew of the titular Odyssey One, Earth’s first interstellar spaceship, as they embark on the first manned journey beyond the bounds of the Milky Way. The discovery of the new Transition Drive and the creation of the Odyssey One finally saw the end to a decades long war. Of course it is Evan Currie’s military science fiction space opera novel Into the Black: Odyssey One, originally self-published, was released by Amazon’s new imprint 47north back in March. The novel centers around the exploration crew of the titular Odyssey One, Earth’s first interstellar spaceship, as they embark on the first manned journey beyond the bounds of the Milky Way. The discovery of the new Transition Drive and the creation of the Odyssey One finally saw the end to a decades long war. Of course it isn’t long into this journey that the Odyssey stumbles into a new and more dangerous threat, and that is where the novel’s story truly kicks off. Into the Black is very traditional sort of military science fiction that definitely falls in line with it brothers and sisters in the military sci-fi/space opera genres. You have a humanity that has grown achingly familiar with war that, when faced with peace, must struggle to find something to do with the droves of soldiers it has left on its hands. Similarly you are also given a society with no experience with the organisational structure necessary for deep space travel. As a result unlike many other novels with a similar premise Into the Black reveals a ship whose crew is still growing used to the unique difficulties of a military force operating in deep space. This would be a fascinating aspect on its own but Currie uses it only as a background element to the more overt notions of duty and honor that drive the rest of the plot forward. In a bit of an eye-rolling coincidence the crew of the Odyssey are quick to encounter a race of alien humanoids whose society has strayed far from the violent and war-like tendencies of humans. Thus there are many moments in Into the Black where our various human characters are forced to toll the virtues of service and the willingness to do violence in order to protect the greater good. Unfortunately, all these monologues are precisely that: monologues. The reaction to humanity’s violent tendencies is never given more than a cursory examination and the perspective of these aliens, their belief structure and social customs, are mostly glossed over in the name action and excitement. To be completely fair all of that still manages to remain an entertaining and engaging read but there are many bits of information and hints that Currie drops which could have been used to give the novel a more well-rounded feel as well as some greater depth. This comes to fore especially when you meet the mysterious and enigmatic “Central” during a scene which offers the most engaging discussion in the entire novel and marks one of the few moments when the military fades to background in favor of the science fiction. This instance is fleeting and it isn’t long before readers are thrust back into the action once more. The characters of Into the Black are defined by what they do rather than who they are. In the end we are left with a group of characters that are all too similar to feel completely unique. There are flashes here and there of potential but again Currie backs away from those moments in keeping the plot pushing forward. Other than their roles aboard the Odyssey or elsewhere there is very little to help differentiate characters from one another. Truth be told with as large a cast as the novel has there is just too little time spent behind the eyes of any single character to really get a handle on them beyond the basics. "Warriors are never appreciated in peacetime, except by those they saved during the war." I have never read military science fiction before and am now official in love with the genre. It was great to find our armed forces written with such nobility and compassion in the genre. Too often in science fiction there is a dark military industrial complex looking to rule the universe. This book takes place in a near future where the world is getting back on its feet after WWWIII, North American Block v "Warriors are never appreciated in peacetime, except by those they saved during the war." This book takes place in a near future where the world is getting back on its feet after WWWIII, North American Block vs Eastern Block, and taking its first foray out beyond our galaxy more for global moral purposes than scientific expectation. Captain Weston's Odyssey has a crew of scientists and a mix of military from all branches of the sharp end; the best of the best, deadliest of the deadly, were asked to join the crew as security. It is understood that this is the government putting them to pasture as the political climate switches from war to peacekeeping. For this the same reason all the best of the war time armaments are loaded onto the Odyssey resulting in a very well armed space exploration vessel expecting no trouble at all. Whatever the reasons I would never enter the unknown black of space any other way. Immediately after their first jump the Odyssey detects a distress signal that leads them to an escape pod amidst the remains of a recent space battle. The survivor is a very human woman from one of the many colonized and highly populated worlds with thousands of years of history we knew nothing about. She hints that our world could have evolved from "the others, the oath breakers" but, as there is a social stigma attached, she never goes into it. Besides, there are bigger issues, like what just killed two of her planets. Thousands of years of peaceful civilization had bred a complacency towards defense Weston and his crew have trouble understanding. Armed to the teeth or not the Odyssey did not venture into space to involve themselves in someone else's war, but neither will they stand for genocide. This was another debut military sci-fi novel, this time by Evan C. Currie. However, unlike the "Man of War" series I recently started as well, this one is not only quite clearly a "first novel", it is also clear that it was self-published first. Although it gets better near the end, the first part of the book is amateurish and difficult to continue listening to. It shows why good editors are so important in fiction writing. The author makes a number of choices in the story that simply are too much to possibly believe. Feeling like a kind of cheap Star Trek copy, the novel starts with humanity's first faster-than-light ship's maiden voyage, that then quickly turns into a Jack Campbell-style military sci-fi romp. But the jump is way too sudden, and the situation utterly unbelievable. Almost immediately upon arriving at Alpha Centauri, the ship responds to a distress signal in yet another system, which they blindly follow, after which continues one unlikely decision after another until this fleet is involved in full-scale battles with alien forces. It is simply not believable that such a captain would make decisions like this, not based on our current knowledge of military procedures and extensive and careful prototype testing. While the book does get better later on (at least the space battle are well done), it can't make up for the strange and out of place decisions that are made by both the author and characters in the first half. Another seriously unbelievable element is in the type of "aliens" they run into, although I won't spoil that particular point. Ultimately if he wanted to write an exploration novel, then exploration should have dominated the theme of the book and the conflict kept small and realistic. If he wanted to write military space battles, then he should have introduced us to a world in which this was already feasible, not tacking it on to what was essentially an exploration mission. Some people might disagree with me and say that it worked for them. If so, then please continue reading and I hope you enjoy the rest of the series. I'll be stopping here, thanks. At the end of a long and devastating war on earth - World War III - the nations of the confederation (The US, Canada and Mexico) built the first FTL ship and sent it off "into the black" for a shakedown cruise. Until then they had labored under the impression that they were the only sentient species in the galaxy and the Odyssey One was the ship to find out if that was true. What Captain Eric Weston, war hero and Archangel Pilot, finds out changes everything and depending upon how the informatio At the end of a long and devastating war on earth - World War III - the nations of the confederation (The US, Canada and Mexico) built the first FTL ship and sent it off "into the black" for a shakedown cruise. Until then they had labored under the impression that they were the only sentient species in the galaxy and the Odyssey One was the ship to find out if that was true. What Captain Eric Weston, war hero and Archangel Pilot, finds out changes everything and depending upon how the information he returns with is received, may make him a hero or a criminal. The book is packed full of technical information on laser based fighting and ablative shielding of ships and the action keeps all 600 pages of it moving along at a good pace. There are diverse characters from Captain Weston and his XO Commander Roberts, to the Archangel Fighter Pilots that make up the screening and fast attack force and the confederation troops that make up the recon forces and while we get to know them they aren't really fleshed out, the book is much more action than character driven, which is unfortunate in some ways as some alluded to an interesting backstory that isn't really explored. This is an exciting space opera where some humans from Earth first journey to the stars, and discover that it's a scary place out there. If you are relatively new to scifi, this should be a refreshing read. If you are well-read in this genre, you will see where the story borrows from Heinlein, Kris Longknife, and others. The author even acknowledges this, but don't let that deter you. This books is well crafted and entertaining. This is an archetypal space opera, but is no less enjoyable for being typical of the genre. I quickly became involved with the characters and was looking forward to how the story might develop. However, I did have a few worries early in the book, the Captain appeared to be ridiculously Gung-ho and was beginning to wonder if the whole book was going to be unbelievable. The ship comes across the debris of a big space battle and he decides to follow the possible route of the combatants This is an archetypal space opera, but is no less enjoyable for being typical of the genre. I quickly became involved with the characters and was looking forward to how the story might develop. The ship comes across the debris of a big space battle and he decides to follow the possible route of the combatants. This may or may not be a good idea, but what irritated me was the Captain had a survivor he could ask about the battle. So does he wait a few hours and find out what the survivor knows or does he charge off into the unknown with no idea of what he is getting into? Fortunately, this turned out to be only a minor aberration and the story became a decently paced, fun Sci-Fi novel.